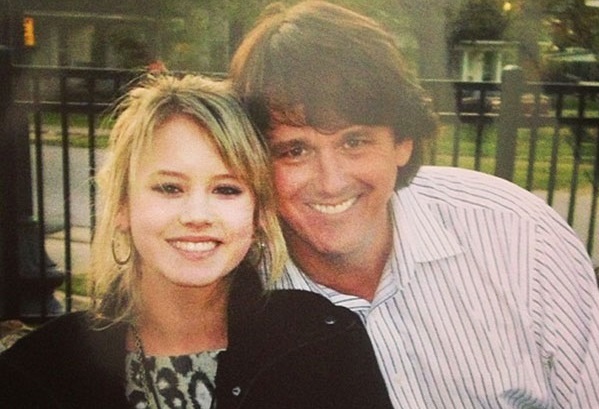 Taylor Spreitler with her father, Danny Spreitler. Taylor Spreitler has seen her star rise since finishing a 17-month run as teen Mia McCormick on NBC soap opera Days of our Lives in 2010, most notably with a starring role in Freeform sitcom Melissa & Joey. Along the way, Spreitler often praised her father on Instagram, sharing moments with him and calling him one of "the most amazing men I've ever known." Sadly, the 22-year-old actress revealed in an emotional Instagram message on Thursday night that her dad, Danny Spreitler, had committed suicide. "Today my heart is hurting," Spreitler wrote. "My dad took his own life due to his struggles with depression." "I am deeply saddened and will miss him dearly as he was my inspiration and biggest cheerleader," she explained. The actress said she went public with the news of his death to help others who might be suffering from depression. "I am sharing this news with my all my fans as I want to educate everyone on the pain that depression can cause," she said. "My mission now is to educate others on how to get help." "If you know someone who is struggling, please tell them to call the National Suicide Prevention Lifeline at 800-273-8255," she continued. She concluded her message on Thursday asking for space to mourn her loss, and expressing gratitude for the care she has received so far. "I ask that you respect my family’s privacy during this time so we may heal from the devastating news. Thank you for all the love and support." Today my heart is hurting. My dad took his own life due to his struggles with depression. I am deeply saddened and will miss him dearly as he was my inspiration and biggest cheerleader. I am sharing this news with my all my fans as I want to educate everyone on the pain that depression can cause. My mission now is to educate others on how to get help. If you know someone who is struggling, please tell them to call the National Suicide Prevention Lifeline at 800-273-8255. ‎Also, I ask that you respect my family’s privacy during this time so we may heal from the devastating news. Thank you for all the love and support. Spreitler spoke frequently about her family in a 2009 interview with We Love Soaps, including her father's humorous reaction to her troubled Days character. "My dad said, 'What could make me more proud - my daughter is 16, homeless and pregnant.'"